When it comes to off-the-shelf Fraud Management Software (FMS), operators generally choose one of three off-the-shelf choices today: a traditional CDR-based system; a SIP-based FMS that blocks calls based on a black list; and a cloud based FMS for small operators and OTTs. A top-of-the-line FMS becomes a wise investment because its greater depth of features may better protect the brand and help retain customers. To me, an off-the-shelf FMS is like a good country doctor. If you grew up in a small town as I did, the country doctor was crucial to your community. He was an expert because he had the experience of handling the medical cases of hundreds of families. And he was also very accessible, reliable and affordable. However, in the last 40 years, we’ve seen the rise of tech-driven medicine with the arrival of diagnostic tools, such as MRI machines and CAT scanners, that detect deeper medical problems that a country doctor could not discover on his own. And if a cancerous tumor must be removed, the surgeon will use tech-driven “minimally-invasive” procedures and tools to reduce the danger of infection and heal the wound caused by incisions the surgeon makes as he removes the tumor. Now I’m not knocking country doctors, but telecom services have gotten more complex and fraudsters are adept at hiding in that complexity. So there’s a market for analytics-driven fraud diagnostic tools and more targeted treatment that lessen customer experience mistakes such as blocking calls to legitimate businesses. One guy who is a big proponent of a more tech- and analytics-driven FMS is Jason Lane-Sellers, a well-known fraud-fighter at operators and vendors over the years, and a current Vice President of the CFCA. I recently caught up with Jason and he explained his new role as Product Offering Manager at Mobileum and the highly interesting analytics-based Detection and Prevention System his company brings to market. Dan Baker, Editor, Black Swan: Jason, first things first, you’re going to talk about an “analytics” solution, so it would be good to hear what “analytics” means to you. What’s the context? Jason Lane-Sellers: Well, Dan, I’m using the term analytics in two senses, really. First, a true analytics system is not restricted to a relational database utilisation. And if you’re not so constrained, you can gather data from multiple data sources beyond CDRs, even adding unstructured data from emails, social media, and call center logs, for example. Second, I’m also referring to machine learning, an analytics platform that goes further than traditional rules-based systems which wait for a certain defined threshold (or combination thereof) to be reached. Rather, a machine learning system constantly builds up its knowledge and can flexibly create profiles on a broad range of things — not just the usage of a particular phone number, but also by device, by region, or by demographic group. A network of many individual entities can be analyzed, and that, in particular, is very valuable in fraud control. I think we’re now beyond the hype stage in analytics and machine learning. The tools have come of age. And the credit goes to the big web companies like Google and Facebook who jump-started these tools. It’s all about dealing with massive volumes in a complex environment — and being able to comfortably identify and highlight problems with great accuracy. 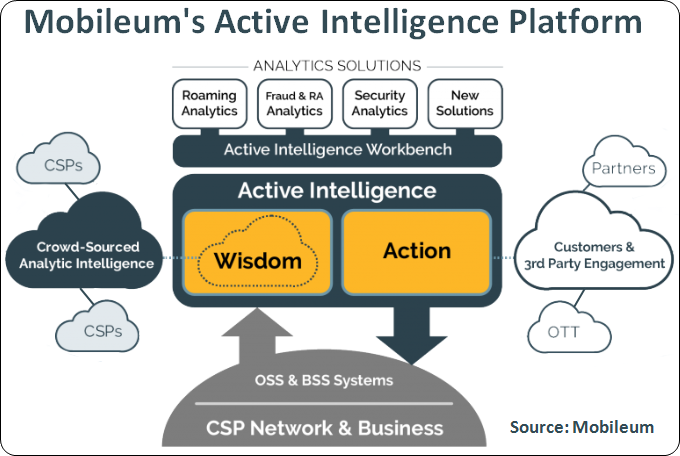 Knowing in your career you worked for other FMS vendors such Neural Tech and cVidya, I’m curious what attracted you to join Mobileum, a relative newcomer to fraud control?. To be honest, yes, I was rather skeptical because I had only known Mobileum from their roaming expertise. But I was quite amazed when I saw how much they accomplished in the fraud area without having that deep domain expertise. 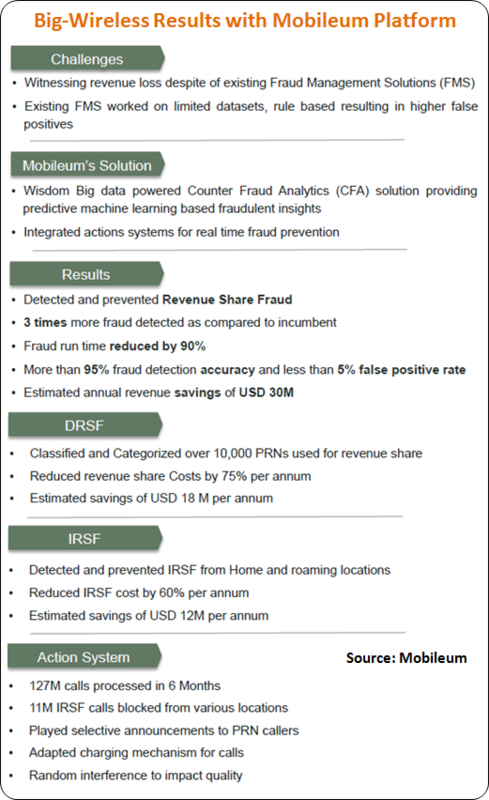 Fortunately they had a key customer who was flexible and enabled Mobileum to learn along the way as they further developed a fraud solution based on a strong analytics platform. 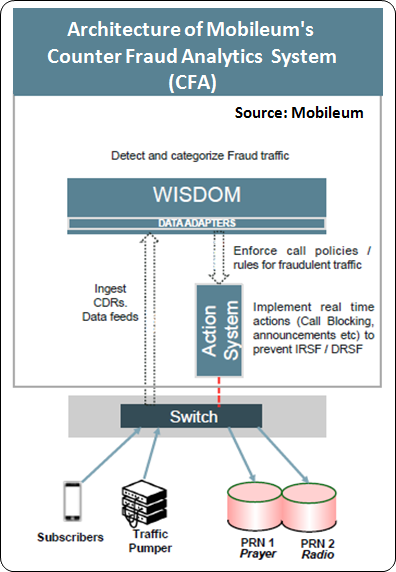 And the reason Mobileum has been quiet up to now is they were busy developing their first full-scale fraud detection and prevention solution for a large North American wireless provider. That project has been up and running now for over a year, and the client has allowed us to share some of the aggregate results while keeping their name confidential. Let’s just call them Big-Wireless. Great, let’s walk-through the challenges and benefits your system delivered at Big-Wireless. Dan, as you’d expect, Big-Wireless already had a full-blown fraud system and mature processes around that. But their revenue assurance team was nonetheless eager to extract deeper fraud control benefits, as I’ll explain. Now in North America there are two kinds of revenue share fraud — there’s the international side, but also a significant level of domestic fraud. And domestic revenue share was a tough issue for Big-Wireless because they didn’t fully understand the traffic profile. For instance, if they saw traffic passing through a suspicious region, they were really not sure if the traffic was an information service, an audio conference, prayer service, radio service or a revenue share fraud. But now with the finer grain of detail analytics provides, they could produce profiles of various traffic types. And that turned out to be quite valuable. It meant they could confidently apply a variety of treatments to the traffic. Some suspicious traffic was blocked, and in other cases they inserted "whispers" or messages such as "press 1 if you wish to continue this call". The upshot was Big-Wireless identified and stopped multi-millions of minutes worth of domestic revenue share fraud in one year. Then, applying the Mobileum solution to do similar analysis of their international and wholesale business, they achieved another increase in annual savings of millions of dollars. It’s interesting how the system works. It actually finds less cases of fraud compared to competing products. The big difference is it has a 97% accuracy rate. And from my experience, other systems are lucky if they have a 30% accuracy rate at identifying fraud, meaning that as well as finding more fraud and preventing loss, the carrier's own fraud operations are more efficient. And when you consider how much time fraud investigators spend chasing false positives, that’s a very big factor. At Big-Wireless, we also expanded the solution beyond fraud to better analyze SS7 breaches and firewall threats as those attacks are in progress. Interesting. And it sounds like there are some good parallels with the analytics tools that segment customers for marketing campaigns. Yes, marketing faces the same problem. If your rules are too rigid, you are basically treating everyone the same. In the case of fraud control, when you can’t treat with more discretion, you end up leaving a suspected fraud case open because you’re afraid to impact legitimate users. So the ability to properly segment their traffic was a huge benefit for Big-Wireless. Only when they understood what the traffic really was — and were confident in their ability to recognize it — could they implement a strategy for treating traffic with a high level of precision. But it all starts with having high accuracy in the first place. With high accuracy, you’re no longer wasting your time saying sorry to an upset customer because you blocked something you shouldn’t have. This is the benefit of our Active Intelligence platform that has two components: Wisdom, the analytics/intelligence engine, and Action the in-line real-time action part of the system. OK, so we talked about domestic revenue share fraud, how is the solution applied on the international side? Well, one important area is the fraud identification and tracking of phone numbers and ranges that are of risk or interest. In the country of Spain, for example, there are several revenue share numbers that are actually hidden inside number ranges right next to banks and taxi companies. So if you block the full number range, you would block the whole customer experience for people using the bank. On a country level, you really need to get down to as low a level in a number range as possible. The old fashioned way is go down 4 levels from the Country code to block number ranges for a set of 1,000 numbers. But if there are banks and other key businesses in that range, you’re asking for trouble because you could shut down communications to those businesses. What Mobileum’s technology does is allow you to go down to the lower level with accuracy, for example to Prime -2 where you can set a range of only 100 numbers or lower if needed. By having the flexibility to apply the different levels intelligently based on the analytics, can then act upon the different levels in different ways. To do that, the Mobileum system monitors incoming and outgoing calls or attempts. It looks at all aspects of the calling traffic such as the locations of calls — dialing from and dialing to. And that intelligence is built into the usage profile for a single customer, the traffic segment, the region, and other segments. When you have such data, you’re much better able to decide what numbers are at risk: you identify either problem customers, problem SIMs, devices used, and also the number ranges being used. Can you provision the network changes? Yes, and that’s the Action part of our solution. Remember: Mobileum has been in the roaming game for many years and we have more than 600 customers in that space, so deep real-time mobile provisioning expertise is in our wheel house. We have SIM control systems and steering capability. And having that domain expertise means we can deliver network policy and fulfillment directly: we don’t need a third party network controller in the mix. Another key benefit of the Action platform is its speed. A traditional fraud system might take several hours to discover a problem, because the fraud has to hit a defined threshold within the current rules before an agent looks at the specific case. But by automating the treatment, the Wisdom platform saves a tremendous amount of time and fuss in terms of accurate fast detection enabling immediate action via the Action component. It cuts that several hour detect-to-action time down to real time. In fact, we are already doing this treatment work for operators who do not have our fraud solution. A Northern European operator, for example, has its own fraud systems but we are doing the Action provisioning part for them. Also, our steering and policy control systems are in place there so we take a feed from their other fraud systems and take action on it. The beauty of this for a mobile operation is the Action platform can control your roaming policies, call blocking, and how you terminate calls with messaging, and merge IVR with messages. Add those things up and you’ve got a platform that does everything from marketing to fraud control. Nice briefing, Jason. Moving analytics and machine learning into the revenue share fraud space is certainly something a lot of operators are looking for. Dan, we covered a lot of ground in our discussion but I can’t emphasize enough that the secret here is accuracy. Big-Wireless proved they could accurately classify fraud attacks and other issues down to the 97% range. So you’re not chasing a bunch of false positives. And it’s this high accuracy that enables an operator to get efficient and not make costly treatment mistakes that lead to customer experience problems. The platform is also fast. In most cases you’re either blocking or treating on the first or second fraudulent call, so it’s better than meeting a threshold target or a dollar amount. Lastly, our successful system at Big-Wireless shows that a fraud-tailored machine learning system is effective at killing a fraudster’s profits. And that means you can take away their incentive to play games in your backyard. Jason Lane-Sellers, a well-known fraud-fighter, is Product Offering Manager at Mobileum. Long active in the CFCA, he now serves as the organization’s Vice President.